As we sit, read, and talk to our children about Martin Luther King Jr last month and the message he has spread, we wonder, what can we do to show our children that diversity should be celebrated. A few years ago I had overheard two, four year-olds talking and playing, one little girl said to the other, “Your skin is dark like chocolate… do you taste like chocolate?” The other child responded, “I don’t know” as she stuck out her arm and licked it. I couldn’t help but giggle at the innocence that was displayed, as the little girls continued to play with each other. Sometimes talking about differences can be awkward some, sometimes, we may not even know what to say and sometimes it can be at the most precarious times! Exposure to diversity is very important for our children and to help them grow into well rounded adults. By children meeting other people and other children that are different than them, it can help teach them to be more acceptable of other’s differences (stop future bullying) but they still need your guidance to help them make sense of diversity. 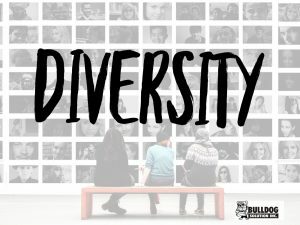 Teach your children to celebrate differences and uniqueness by using positive language. Labels can cause us to lose sight of a person’s individuality, and their individuality, and focus on the label. When your child says something, turn it into a positive, “Her skin is darker than mine” you can respond with, “It is and isn’t it beautiful? It so lovely that we all have different skin tones, it’s what makes us special!” Children understand this, and it makes them feel special and celebrate other’s differences. Seek out diversity in books, movies, and media. There are many books that show different types of families, children with disabilities, races, and other types of families and differences. These books help celebrate differences between us; they are great ways for children to ask questions at home and can give you some extra time to look up resources if need be. Let’s not be afraid to talk to our children about differences, and let’s celebrate them! By giving our children a basis in understanding one another and our differences we are creating a better world for them and can help in the prevention of bullying.